The World of Sport has produced some memorable shocks over the years although we tend to associate this type of result specifically with football. Leicester City, Premier League Champions 2015-16 – Greece, Winners of Euro 2004. In contrast, tennis is a relatively predictable discipline and that has been proved by the likes of Novak Djokovic and Roger Federer who have dominated the game in recent years. So, by those standards, maybe Goran Ivanisevic’s Wimbledon Men’s Title of 2001 should be ranked as the greatest sporting shock of all time. Outside of his native Croatia, the left hander was known by Wimbledon crowds as a plucky runner-up. 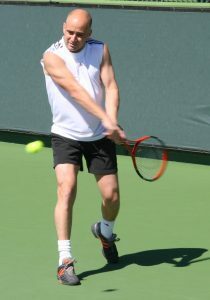 His first final defeat out of three – to Andre Agassi in 1992 – was an epic five set encounter that Ivanisevic would feel that he should have won as all the momentum was with him going into the decider. Goran had taken that fourth set by the significant margin of 6-1 but the American would not give up and dug deeper than his opponent when it finally mattered. For years, the 1992 final appearance looked like it might be the closest Goran Ivanisevic would come to claiming a grand slam title. In the Australian and French Opens, he would never progress beyond the quarter final stage while a semi final appearance at Flushing Meadow in 1996 was his best attempt at the US Open crown. At the start of 2001, Ivanisevic was 30 years old: not exactly a veteran in tennis terms but his best days were behind him and a shoulder injury was preventing him from taking part in any meaningful tournament play. His world ranking had dipped to 125 – not enough to gain automatic entry into Wimbledon – but as a three-time finalist, the All England Tennis Club were happy enough to grant a Wild Card to a man who had contributed so much to previous tournaments. 2001 also marked the year that the list of singles seeds was expanded to 32. Naturally, Goran wasn’t among those top 32 so, if he was to make any impression on what looked to be his last Grand Slam event, he would come across some top players along the way. In the first round, Ivanisevic came up against the qualifier Fredrik Jonsson of Sweden and the Croatian came through with relative ease and a 6-4, 6-4, 6-4 scoreline. He could have faced tougher opponents – Jonsson’s highest ever ranking was 107 – so this was a gentle way for the big left hander to get back into major tournament play. The second round was, however, going to be much tougher on paper. Spain’s Carlos Moya was seeded 21 and was a hot favourite to end the Croatian’s run at that stage. After taking the first set on a tie break, the crowd fully expected Moya to close the game out but Ivanisevic rallied to take the game by three sets to one. Suddenly it seemed as if Goran may go deep into the tournament after all. A quarter, or semi final appearance could have been in prospect and we knew that he had the talent, even if we didn’t expect what was to happen next. The third round tie against Andy Roddick could have been another problem for Ivanisevic. Like his opponent, the American was unseeded but the two men were at opposite ends of their respective careers. The young, big-serving Roddick would go on to win the US Open and reach three Wimbledon finals but for now, Ivanisevic was to progress in four sets. 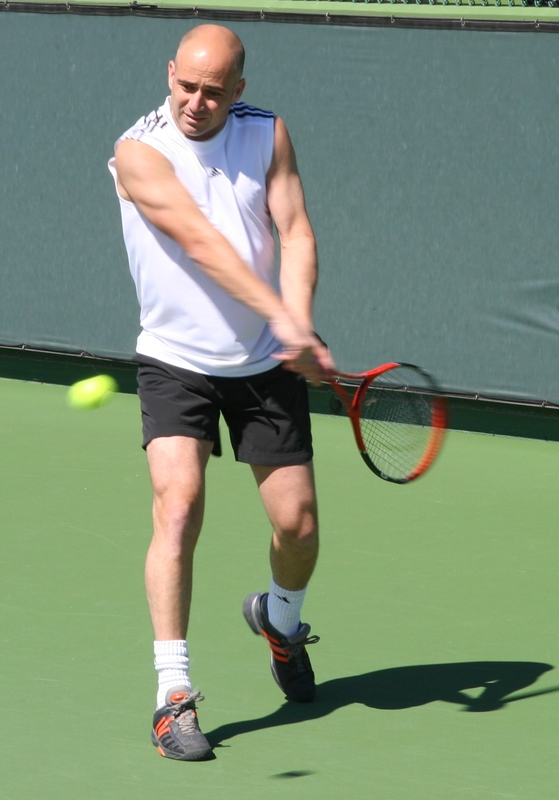 Round 4 brought on Greg Rusedski who was also past his best and struggling to find the form that had taken him to the US Open final four years earlier. The Brit was despatched in straight sets. Suddenly, things were opening up for all the players as top seed Pete Sampras went out to a then-unknown 19 year old Swiss by the name of Roger Federer. Tim Henman saw off Federer in the quarter finals and in the same round, Goran Ivanisevic went through after a hard fought four set tie against fourth seed Marat Safin. Suddenly, people were starting to take the Croatian seriously particularly as the semi final was the round where next opponent Tim Henman would typically choke. And so it would prove as an epic five set match came to an end with Ivanisevic winning 6-3 in the decider. Goran could have been matched against his former nemesis Andre Agassi in the final but a defeat at the hands of Pat Rafter saw the Australian fourth seed tackle the Croatian wild card in the men’s final. Persistent rain, in the days before a roof was introduced to the main court, meant that the tournament had extended into a final Monday and those who packed the arena were treated to one of the best tennis matches in living memory. Once again, we knew that Goran had the talent but could he possibly win after such a long and gruelling tournament? There were no signs of fatigue of the injury that had hampered him at the start of the year as the Croatian took the first set by six games to three. Rafter came back to level before Ivanisevic took the third by the same scoreline. Once again, Rafter came back and with the four sets being shared and won so convincingly by each player, it was tough to identify a pattern. Perhaps, therefore, we shouldn’t have been surprised to see the final set stretch to an incredible sixteen games. With Ivanisevic leading 8-7, the final game was to prove an emotional one as the Croatian sought assistance from the Almighty and let superstition demand that he kept serving with the same ball. Finally, after four match points, Rafter returned a booming serve back into the net and Goran had won. The emotion wasn’t over as he climbed into the crowd to embrace his father Srdjan, who had just undergone triple heart bypass surgery, before dedicating the victory to his friend and former NBA star Drazen Petrovic who had passed away in a car crash in 1993. It’s hard to overstate just how incredible this victory was and to this day, Goran Ivanisevic is the only wild card entry to have won the men’s singles at Wimbledon. He could have retired with a respectable career but as the man himself said, nobody remembers the guys that finished second. It’s a nice plate but you don’t want to have that plate at home. Nobody cares for second place. If you want to go back now and think of Wimbledon finalists in the past 15 years, to be honest, I have no idea.